My name is German Brandazza. We are a family company that controls 50000 acres in Spain, in the middle of the best area for hunting beceite ibex. The name of the village nearest to the lodge is Benasal in the province of Castellón. The lodge was built in 1601, is very comfortable and has all the comforts, trophy room, excellent rooms with complete bathrooms, wifi, bar, and excellent food. You will feel comfortable at all times. The most important thing is that you will stay in the middle of the hunting area. From October 1st to May 31st. Best time is from November 20th to December 20th. 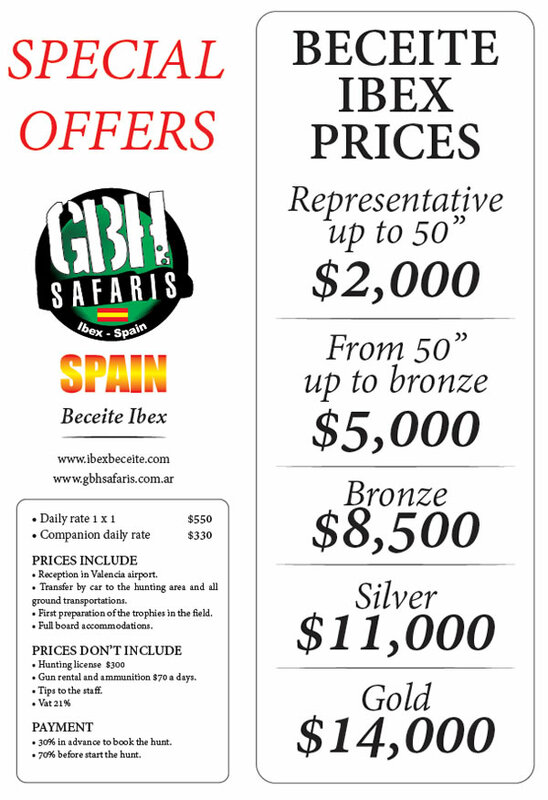 GBH SAFARIS participates and has booths at two hunting conventions in the US. These are the Dallas Safari Club show in Dallas and Houston Safari club show. You are most welcome to visit us at our booths. Dallas, TX. January 17 - 20, 2019, Booth 2600. Reno, NV. January 9 - 12, 2019, Booth 535.